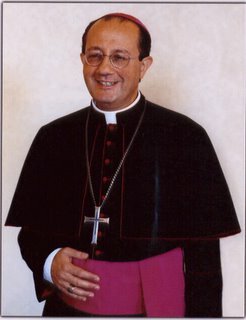 Fama habet out there is that Italian Archbishop Bruno Forte of Chieti-Vasto -- who's already being cited as a future papabile, despite lacking (at least for now) that magic shade of red -- delivered a virtuoso turn last week in giving the annual JH Walgrave Lecture at the American College at the Catholic University of Louvain. Forte, 56, once called "the most famous Italian theologian in Italy," is much (much) more progressive than Ratzinger. But still, he is seen as a particular favorite of not only this Pope (so much so that his name did come up as a possible CDF head before Levada was chosen), but of Papa Ratzi's predecessor as well. After giving the Lenten Spiritual Exercises to John Paul and household in 2004, it's said that the late pontiff told then-Don Forte, "I will make you a bishop." And, when it happened -- a grand total of three months later (and to a metropolitan see, no less) -- who would be his principal consecrator? Joseph Ratzinger, of course. [P]erhaps [the most] most devastating consequence of this war is in consciences. It demonstrates the triumph of arrogance, the brutality of the law of vengeance guiding relations among peoples, the answer to the barbarity of a bloody regime with the barbarity of violent use of weapons of mass destruction at the expense of an entire population. With what courage will the American administration combat the already extensive violence within the United States? And who will be able to convince the citizens of the world that honesty, the respect of the rights of everyone, and the defense of the weak are values worth pursuing? Corrado Alvaro wrote, "The most subtle temptation that can take over a society is that of thinking that to live rightly is useless." Bush and his allies are doing everything to make the world fall into this temptation. Anti-Western and anti-American hatred will increase everywhere with truly unpredictable consequences. And that from a Catholic bishop, one said to have a papal destiny. The dream of emancipating life and the world seems, then, to have broken itself against the unheard of violence produced by the age of emancipation. Eloquent witnesses to this are the wars, ethnic cleanses, crematory ovens, the Shoah and genocides of the twentieth century, as well as the massacre caused by hunger every day in the world. Are these the fruits of adult reason? Where are the new heavens and new earth promised by the great ideological narratives? This is the triumph of the mask over truth: even the very values themselves are often reduced to banners hoisted to camouflage the lack of real meaning. Human beings seem to be reduced to a "useless passion" (the expression used, disturbingly ahead of the times, by Jean-Paul Sartre: "l'homme, une passion inutile"). One could say that the most serious malady of this so-called post-modern age is the definitive abandonment of the search for a father-mother towards whom to hold out our arms, our no longer having the will or desire to seek a meaning worth living and dying for. Orphaned by the ideologies, we all run the risk of being more fragile, more tempted to shut ourselves up in the loneliness of our own selfishness. This is why post-ideological societies are increasingly becoming "crowds of solitudes", in which people seek their own self-interest, defined according to an exclusively selfish and manipulative logic: faced with the vacuum of ultimate meaning, we grasp at penultimate concerns, and seek immediate possession. This explains the triumph of the most shameless consumerism, of the rush towards hedonism and whatever may be enjoyed at once; but this is also the deep reason for the emergence and affirmation of forms of thought which are sectarian, narrowly ethnic, nationalistic or regional, and which spread with alarming virulence throughout Europe at the end of the last century. Without the wide horizons offered by truth, we easily drown in the selfish loneliness of our own particular situation, and our societies become archipelagos, collection of separate islands. Yet, it is exactly this process which shows that we all need a common father-mother to free us from the confines of our selfishness, to offer a horizon for which to hope and love - not the claustrophobic, violent horizon of the ideologies, but one which truly frees all, and respects all. So if the "society without fathers" ran after the dream of emancipation, and to achieve this dream sought to destroy the father, it is precisely this bitter fruit of totalitarian and violent emancipation - and the vacuum it created - that evokes the newly felt need for a father-mother who welcomes us in freedom and love. This is certainly not to seek a father-mother whose place could be taken by the party, or the boss, or unquestioned leaders, or money, or capitalism; it is, rather, the longing for a father-mother who, at one and the same time, founds the dignity of each person, the freedom of all, and the meaning of life. In short, faced with the indifference and lack of passion for the truth which characterizes our present age, our greatest need is to discover the countenance of the father-mother who loves us. It is our longing for the Totally Other, of whom Horkheimer and Adorno spoke as they foresaw the crisis of the ideologies. It is the yearning for the hidden Face, the need for a home to be shared, which provides horizons of meaning without violence. The lecture runs 20 pages in total, so there's way too much to snip for these pages. Do go read. Given that Archbishop Forte will almost certainly be made a cardinal in this pontificate -- he's said to be in line for his home see of Naples, whose incumbent, Cardinal Michele Giordano, turned 75 last year -- and would likely, by the time of the next conclave, be somewhere in his mid-to-late sixties, this sets up the most amazing of all scenarios. Could it be possible that, despite having named 113 of the 115 men who elected his successor in the first instance, a John Paul cardinal will never sit in the chair of Peter?